This summer, Audubon South Carolina has teamed up with the South Carolina Department of Natural Resources and a number of other state and non-profit organizations to work on the South Carolina Shorebird Project. 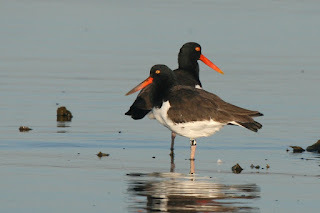 One of our target species for monitoring was the American Oystercatcher. Two adult American Oystercatchers cooling off in the surf. Notice that the closer one has an auxiliary band. Photo courtesy of Janet Thibault. Oystercatchers are common to seacoasts in temperate to tropical parts of the world, and the American Oystercatcher is one of two species of oystercatchers that breed in North America. They nest along most of South Carolina’s less human populated beaches and as far north as Massachusetts. This species, deemed a “Species of High Concern” by the U.S. Shorebird Conservation Plan, is fascinating and easily identifiable by their long orange bill and bright yellow eyes among all the “peeps” that also inhabit SC beaches. They lay their eggs directly on the ground in well camouflaged scrapes in the sand and decorate the edges of their scrape with little bits of shell. South Carolina has approximately 400 pairs of nesting Oystercatchers. As American Oystercatcher nesting season came to an end, we were amazed at the difference in the number of fledgling chicks on various beaches in South Carolina. Our Oystercatcher friends have a lot to contend with during nesting season. There are many factors that can affect a nest’s success (meaning if eggs hatch or not). High tides can wash over nests and scatter or damage eggs, their nests can be disturbed causing damage to eggs, and increases in humans’ real estate decreases the real estate available to birds. 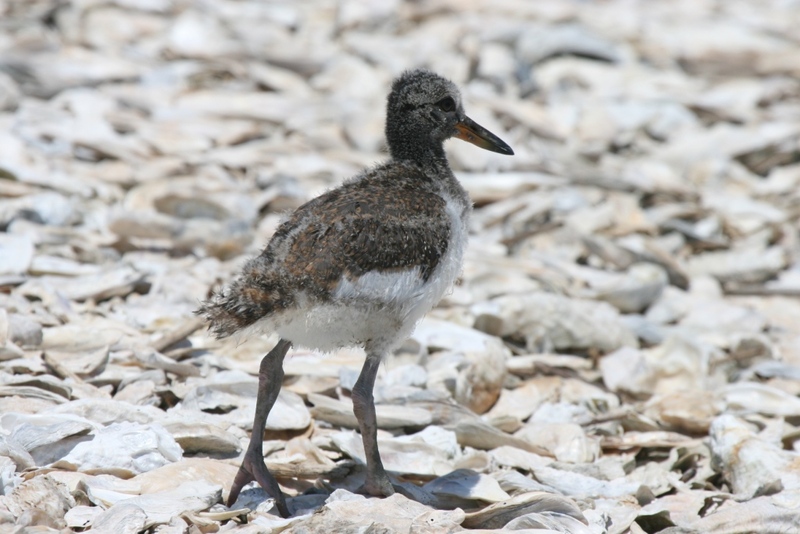 Additionally, predators such as raccoons, dogs, and even other birds will opportunistically eat Oystercatcher eggs and chicks if the parents are off their nest. American Oystercatchers are very finicky birds because when something they perceive nearby as potentially predatory, their strategy is to get off the nest and attempt to draw away the predator. This can be an effective but risky strategy because it exposes eggs to deadly summer heat and keen-eyed predators. This is why it is vital to be mindful of nesting areas and respect posted areas during your visits to the beach. Even a dog on a leash or under voice command can scare parents off their nest from a great distance away. What a cutie! An American Oystercatcher chick waits for mom or dad to bring back food. When chicks hatch, it only takes 24-48 hours before they are up, running, and hiding from predators in wrack and beach brush. Then, after 35 days, the chicks can fly, yet still depend on their parents for food for at least two months after hatching. American Oystercatchers are the only shorebird in South Carolina that feed on shellfish and need to teach their chicks how to hunt and feed. They are named for their distinctive bill which is built like an oyster shucking knife. 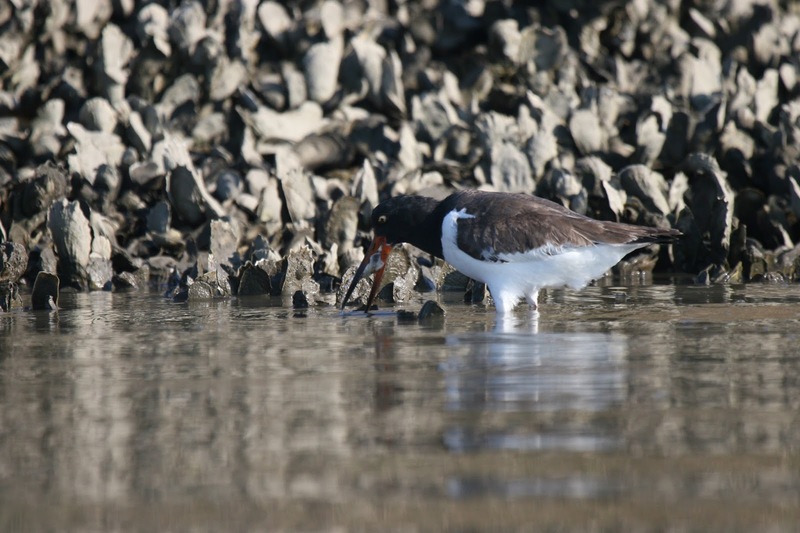 As the tide lowers, it exposes oysters allowing the Oystercatcher to take that chance to slip its beak in, open the oyster and steal the oyster meat. Adults will bring back single oysters to their chicks to show them how to use their beak! Maybe the term “bird brain” should be a positive one. Score! This Oystercatcher successfully grabbed a chunk of oyster out of its shell. So while you’re out enjoying the sun, salty air, and fascinating wildlife, remember to share the beach with our feathered friends. If you see anything you want to share with us, take a picture and tell us about it! We love to hear your stories. The most interesting photos are the ones where birds are acting natural, unaware of your presence, not photos where birds are flying away because they were flushed, or staring at the camera from their nests. Have questions, comments, cool stories you want to share? Email nschillerstrom@audubon.org for more information.